Cautions function in a similar way to static intermissions. The main difference is that where as static intermissions are completely non-lethal, cautions contain a danger on the top side of the object. ▲ A good example of cautions is a set of spikes. 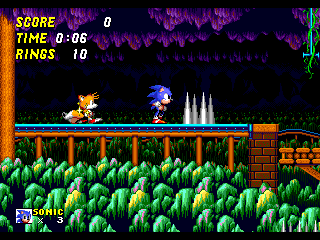 As only the top part of the spikes cause damage, the side can function as a static intermission by causing the player to stop when s/he runs into them. As the top part of the spikes are dangerous, they remind the player to be cautious, and encourage him/her to slow down. This state of reduced speed will give the player a fair chance to pass any nearby obstacles. The slower pace, however, is a voluntary action and so will not cause frustration.